I have recently upgraded from a 2005 vtx 1300R to a 2003 vtx 1800C. Love the power but I have been reading that there are several known issues with the 1800's. The bike has 7k miles on it. It has a few rust spots as well...and ordinary wear to be 16 years old. Anyway, other than looking for final drive fluid leaks or pulling the wheel off, how would I know if I had a bad wheel bearing? Also, the front shocks/springs/struts...are the typically a little bouncy on the 1800? Your post asks about wheel bearings, but your thread title asks about flange bearings. Two very different things. But they can both let you know via noise that they are gone. The better way to identify "time to replace" is just to feel them when you've got rear wheel off bike. If they roll smoothly, they are good. If you feel roughness, then shell out a few bucks. The flange bearings seem to get lots of hype, but lots of people have reported having them almost completely reduced to rust and grit and it still didn't have any catastrophic impact on the bike. Not that I'm saying it's unimportant to have the pumpkin and wheel spin smoothly on the same axis... but just that flange bearing degradation won't likely leave you on the side of the road. Just a good thing to PM whenever your rear wheel is off for lube PM or tire replacement. fork seals and bushings at 83,000 miles..
Back in the day when I was made aware of the issue thru the forum...I purchased several from trike conversions...now when ever I change out a tire ...I rotate out a flange...good luck..
chuck_VTX F, rangers4u, StarrRider and 1 others like this. A member on here, from Wash. St., I think JonsVTX1800C or something like that, has been helping with this problem for years. Lets say you purchased a used VTX, but not knowing the condition of the flange bearing, decide to replace it. Send yours to him, for I think just under $200, and he will send you one thats been inspected and/ or re-man., and bolt it up & ride. IF YOUR CORE that you sent is in decent shape to where he can re-work it for someone else to buy, he will REBATE you a good chunk of that back, like 30-40 % more ore less. In my case, mine had low miles on it, but I got a polished final drive unit of unknown miles, so I followed that procedure with him, and I couldn't be happier. Maybe someone could verify if he still does this? chuck_VTX F, rangers4u, Curt E and 1 others like this. I don't know if Honda ever fixed the issue in later years but certainly early models were prone to flange bearing failure. 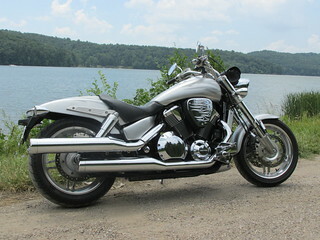 I have an early 2002 VTX1800C, I can't remember the mileage, when the flange bearings failed it's too many years ago now, but it was around the time of the second rear tire change. I replaced them and they failed again a tire change or two later. My thought was that the combined medium press fit of the bearing O.D. into the flange housing and the flanged bushing pressed into the bearing bore was excessive to the point where the internal clearance in the bearing races was reduced enough to cause premature failure. So on the second replacement, I polished both the O.D. of the bushing and the bore of the flange housing just enough to reduce the press fit to a light press fit, that was over 40,000 miles ago. When I changed the rear tire last year, the bearings were still in good condition. chuck_VTX F, rangers4u, DrDolittle and 1 others like this.